Majority of the hit Hollywood movies had always been dependent on a plot related to either vampires, pirates or gunslingers. The horror genre deals extensively with the subject of vampires. Since the inception of Nosferatu in 1922, this character has been portrayed in an extensive range from a grieving lover to a diabolical creature praying on his victim in the dead of night. It will not be wrong if vampires can be categorized as one of the most notorious as well as mesmerizing characters in today’s media world. 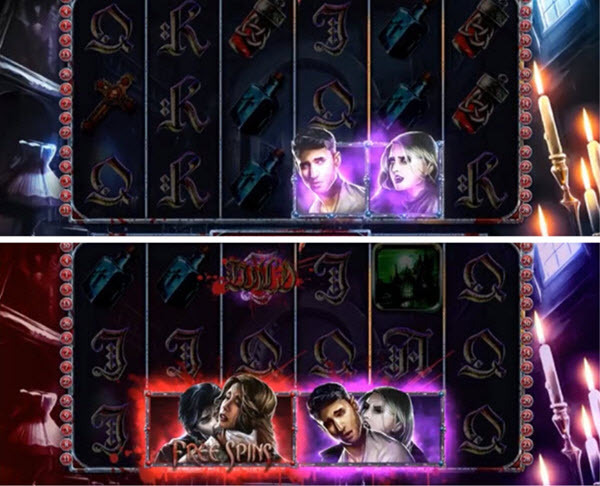 Blood Eternal slot game is a classic horror genre-based game developed by Betsoft and deals specifically with the vampires and their human preys. Blood Eternal slot is six reels and a thirty pay-lines game that comes in a 6×3 format. The design of this game is based on the gothic culture depicting a somewhat foreboding environment. As expected the symbols used in this game relates to vampires and other stuffs related to their existence. The symbols on the reels do not have any kind of casing and the six reels are encased in a frame made of metal. A foreboding foyer with pictures on the wall forms the background of the reels. The reels are flanked by a lamp on the right-hand side and lighted candles on their left side. As expected from a product of Betsoft, the graphics of this game are state of the art with three-dimensional characters. A haunting eerie soundtrack accompanies the base game. The spins are followed with the whirring sounds of the chains. The other most fascinating feature of this slot is the availability of the X2 bat symbol which acts as two normal bat symbols thus increasing the size of any potential win accompanied by this symbol. Blood Eternal slot game comes with a fixed jackpot of 50.000x along with the other usual features which include autoplay, max bet, wild symbols, free games, and bonus symbols. This slot also provides a gambling option for every win during the base game. The maximum coin limit for Blood Eternal is set up at five coins. The coin range starts at £0.01 and goes up to £1.00. The minimum wagering requirement for each spin starts from £0.30 and ends at £150.00. The high paying symbols of this game include a castle, a gargoyle, a bootleg of holy water, an ampoule of blood and a jewel-encrusted cross. The low-value symbols are from a deck of cards that include A, K, Q and J. The castle symbol provides some of the biggest payouts of this game in the following ways. Landing six symbols on an active pay line awards 2500 coins. Landing five symbols on an active pay line awards 1000 coins. Landing four symbols on an active pay line awards 300 coins. Landing three symbols on an active pay line awards 75 coins. The least paying symbols of this game are Q and J with the highest payout of 100 coins and the lowest of 10 coins. Scatter Symbol: Blood Eternal slot does not provide any type of scatter symbols. Wild Symbol: The Wild logo is the wild symbol of this game. It can be substituted for all symbols except for the free spin symbols comprising of vampires and human beings. This symbol can appear anywhere on the reels and helps in creating winning combinations. When this symbol substitutes for a bat symbol then it acts as a single bat. Apart from this, landing different numbers of these wild symbols on active pay-line payouts in the following ways. Landing six symbols on an active pay-line awards 3750 coins. Landing five symbols on an active pay-line awards 1000 coins. Landing four symbols on an active pay-line awards 375 coins. Landing three symbols on an active pay-line awards 100 coins. Bonus Symbol: A couple of vampires and a couple of human beings act as the bonus symbols of this game. The vampire symbols only land upon second and fifth reels. The human symbols only land upon third and fourth reels. When a vampire symbol lands next to a human symbol, Free Spin bonus round gets activated. Along with free spins, these symbols also activate the sticky wilds for the whole duration of free spins. Blood Eternal slot game comes with three bonus features which include the following. Double Bats: This slot provides a single bat and an X2 bat symbol. Both of these symbols contribute to the Bat wins. The X2 bat symbol acts as two normal bat symbols thus creating a greater number of wins as compared to the other symbols. Landing different numbers of bat symbols on an active pay-line payout in the following ways. Landing five symbols in a cluster awards 250 coins. Landing six symbols in a cluster awards 350 coins. Landing seven symbols in a cluster awards 500 coins. Landing three symbols on a pay-line awards 100 coins. Landing four symbols on a pay-line awards 200 coins. Landing five symbols on a pay-line awards 500 coins. Landing six symbols on a pay-line awards 1000 coins. Landing seven symbols on a pay-line awards 2500 coins. Landing eight symbols on a pay-line awards 4000 coins. Landing nine symbols on a pay-line awards 7500 coins. Landing ten symbols on a pay-line awards 15000 coins. Landing eleven symbols on a pay-line awards 25000 coins. Free Spins: Landing a vampire symbol next to a human symbol activates the Free Spins bonus round comprising of eight free spins. While activating the free spins, the symbols involved turning into sticky wild for the whole duration of the Free Spin bonus round. If another vampire and human combination lands to each other during the free spins, more free spins get awarded. During the Free Spin bonus round, the triggering symbols produce Wild Blood splatter which converts other symbols into wild symbols for each free spin. Each vampire and a human pair can generate one to four wilds during each free spin. Gambling Option: All of the base game wins activate this gamble feature. During this feature, a player can opt to gamble to double up the whole or half of the winning amount by correctly predicting a toss of the coin by pressing Heads or Tails button. This gambling option is not available after Free Spins feature.